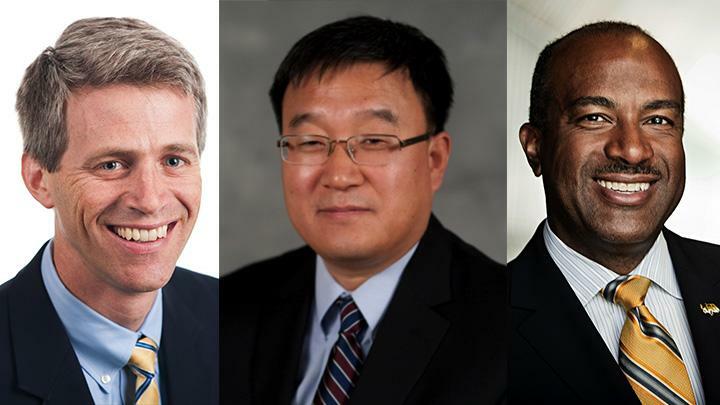 Two current College of Engineering faculty members and an adjunct professor (and former dean) have been named to the National Academy of Engineering (NAE). Election to the NAE is among the highest professional distinctions accorded to an engineer. Professors Timothy Lieuwen and Jianjun (Jan) Shi are two of this year’s 83 new NAE members. They’re joined by adjunct faculty member and former College of Engineering Dean Gary S. May. The group will be formally inducted during a ceremony at the NAE's annual meeting in Washington, D.C., in September. “We are delighted that the National Academy of Engineering has recognized our Georgia Tech faculty members for their outstanding contributions to engineering and as leaders in their fields,” said Steve McLaughlin, dean and Southern Company Chair in the College of Engineering. “We also take great pride that our former dean and Tech alumnus, Gary May, has been recognized, not only for his research, but also for his advocacy in bringing more underrepresented students into engineering. Their induction is a testament to the quality of our faculty members and their contributions to the engineering profession." Shi was recognized for “the development of data fusion-based quality methods and their implementation in multistage manufacturing systems.” He serves as Carolyn J. Stewart Chair and professor in the Stewart School of Industrial and Systems Engineering. May was elected for “contributions to semiconductor manufacturing research and for innovations in educational programs for underrepresented groups in engineering.” The 1985 alumnus (electrical engineering) is currently chancellor of the University of California Davis and an adjunct faculty member in Georgia Tech’s School of Electrical and Computer Engineering. Academy membership honors those who have made outstanding contributions to "engineering research, practice, or education, including, where appropriate, significant contributions to the engineering literature.” The NAE also makes selections based on "the pioneering of new and developing fields of technology, making major advancements in traditional fields of engineering, or developing/implementing innovative approaches to engineering education." The trio joins nearly three dozen other Georgia Tech NAE members. They include Provost and K. Harrison Brown Family Chair Rafael L. Bras, President Emeritus G. Wayne Clough and College of Computing Dean and John P. Imlay Chair Zvi Galil.